In order to work at peak capacity, the lungs need to be clean and clear from pollutants that are inhaled daily. Smoking and exposure to a polluted environment contribute to a poor respiratory condition. According to the Mayo Clinic, an irritant stimulating a nerve in your respiratory tract causes coughing. These irritants can include hair spray, perfume and stomach acids that form mucous, which is a breeding ground for infection and disease. 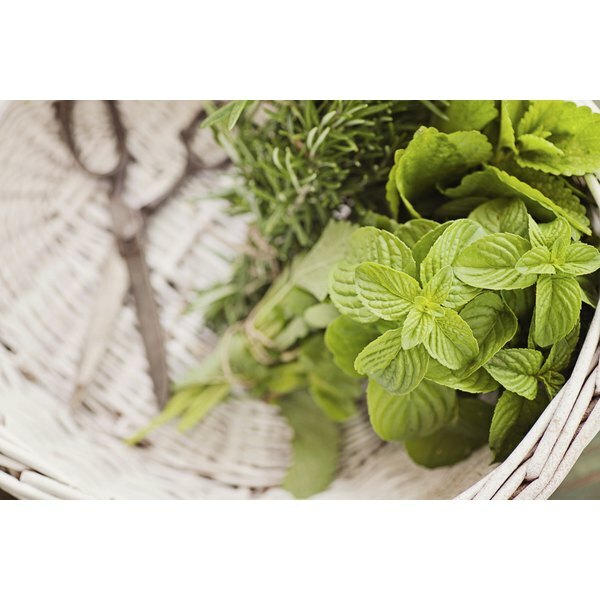 Before starting any type of herb therapy, discuss your condition with your doctor. Angelica acts as an expectorant that causes you to cough, which expels mucous and other irritants irritating the lungs. Vitaminstohealth.com claims that angelica helps strengthen the lungs and has been used to aid in the healing of infections. Another expectorant is coltsfoot. Use it to sooth irritated bronchial passages and to help eliminate a dry cough. Cinnamon is warming and can help with chest colds by loosening the mucous and providing warmth to the area. Mix cinnamon with ginger to make hot tea. Cinnamon also aids digestion. Do not use large amounts of cinnamon while pregnant. Thyme is a powerful cough expectorant and antiseptic. It helps disinfect airways, and it may help calm the bronchial passages. Asthmatics may get some benefit from thyme. Avoid using large amounts of thyme during pregnancy. Multipurpose ginger helps to remove excess mucous from the lungs when you have bronchitis. It is soothing when used in the initial stages of a cold. Ginger is also good for digestion and helps prevent nausea. Garlic helps relieve the symptoms of respiratory tract infections and can strengthen the immune system. It helps clear mucous from the lungs, and it's one of the herbs used in the treatment of lung and bronchial infections. Another herb that aids in ridding the lungs and airways of excess mucous is elecampane. Soothing during a cold, it also helps treat bronchitis in anyone with a weakened immune system. According to the Ultimate Health Research Institute, rosemary leaf is one of the herbs that can clean the lungs. It also helps the flow of blood and other body fluids. Rosemary leaf contains healing vitamins A and C, and minerals calcium, magnesium, iron, potassium, sodium and zinc. Honeysuckle flowers help nourish the lungs and help support the immune system. Use honeysuckle flowers with chrysanthemum flowers for enhanced respiratory cleansing. Fennel helps to calm spasms in the respiratory system. Fennel and fenugreek are both known for cleansing the bronchial passages, according to Marysherbs.com.